For the right type of banner design it’s important for you to work with experienced professionals who know what they’re doing and how to bring your advert to life on a beautiful banner. When you want the banner that you’re using in your marketing campaign to give the right message to your audience you must rely on the skills and talents of printers who have been in the printing business for a long time. Take a look at some of their previous work so that you can see how creative they are in making banners that effectively sell your company. What are the essential elements of banner design? Take note of some of the topics below so that you can have an educated discussion with your printer about the exact banner that you want. Your natural tendency will be to put a lot of details on your banner about your company, what you can do for clients, and how they can contact you. Banner printing experts will advise you to keep it simple so that you can reach your targeted audience without clutter. Your banner will need credible text written in a font that is easy to read, colours that are pleasing to the eye, and your contact details for additional information. The audience that you are targeting will likely be seeing the banner from some distance away, so make sure that you leave out minute details and instead go for headlines that draw their attention immediately. Whether you are ordering pull up banners, pop up banners, or roll up banners your message should be delivered with bright colours that attract attention. Take into consideration where you will be using your banner and share this information with your printer. Together you can choose colours for your banner that are distinct, unique and stand out from the background of the banner. 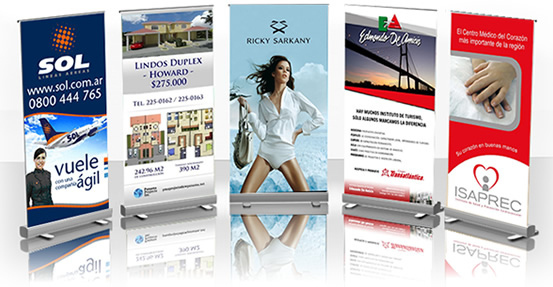 You must determine where you’re going to be using your banner so that you can order the proper size. This allows the printer to design the banner with a resolution that is perfect for the distance the audience will be from your banner. The farther your audience is from your banner the lower the resolution should be. Ask your printing expert what they would recommend for your specific needs. If your roll up banner is being used outside, your printer will probably advise you to leave off a border so that the beautiful colours can set the design for you banner. With indoor banners you may want a border that tones down the banner and highlights the text, background, and logo placed strategically on the banner. Audiences usually read banners from the centremost point outwards so an attractive and well-designed banner can help your audience focus on the important aspects first. By carefully planning the design elements of your banner you can get a marketing tool that brings results, increases sales and improves your business.